Not my intention… – …STILL CRAZY AFTER ALL THESE YEARS! …caught my attention – it looked like they now had nasi biryani as well so I made it a point to go there one morning and check it out. Unfortunately, it so happened that they did not have it that day, only their nasi lemak and I did not feel like having that. …so I bought two packs for our lunch to try. Yes, I would say it was very nice, the rice…and the curry too. They certainly were very generous with the gravy but no, there was no papadum like at those Indian places…but for only RM5.00, I guess there is no cause for complaint. Back to that earlier occasion when the nasi biryani was not available, though it was not my intention to go there originally, I just strolled over to this place, a stone’s throw away to see if they had anything that would tickle my fancy. …before and thought it was not too bad. The curry gravy, with a few cubes of potatoes inside, was very nice and this time around, I opened the egg roll and heated it up in a pan, piece by piece so it would not be so soft and limp. I found it a whole lot nicer, a little bit harder/drier and crispier. I think I shall do it again the next time I buy any and I must say that RM2.00 for 4 pieces, plus that big bag of curry gravy with some potatoes inside, is quite inexpensive. 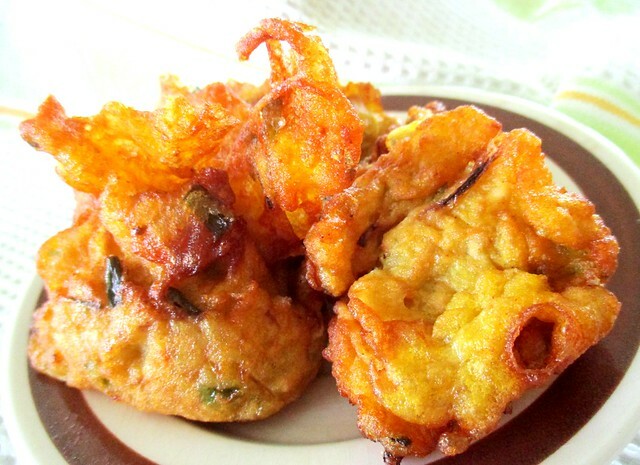 …or deep fried fritters with those dried shrimps, sold in bags of RM2.00 or RM3.00 and they were so very nice that when I went back the second time for the nasi biryani, I went over to buy some more. …that I also bought to try. They were o.k., that much I would say, nothing that exceptionally good as to get me rushing back for more. …from one place in the kampung. I did go and buy from the stall there a long time ago but no, I found it rather disappointing. The nasi (rice) was not lemak which to me was quite a surprise seeing that they actually sold coconut there…and to make things worse, it was hard! Well, it so happened that quite recently, there were people on Facebook who were raving about some nasi lemak that was so so good, tagging their friends and what not so I went to have a look. It turned out to be that same place so of course, I did not bother to stop and buy, once was quite enough, thank you very much. However, when I saw it being sold here that day, I decided I would give it a second chance. This time around, the rice was not hard but sadly, it was still not lemak enough. Other than that, everything else was fine except for that piece of omelette – the standard condiment for this traditional dish should be hard-boiled egg, usually half of it but I’ve had fried egg instead at a number of places here, not that I approve of that either (especially when they do not know how to fry it the way I like it). I don’t recall getting any omelette anywhere except perhaps in those cheap brown paper packs of nasi lemak where you may get a piece, the size of a postage stamp…or one eighth of a hardboiled egg. 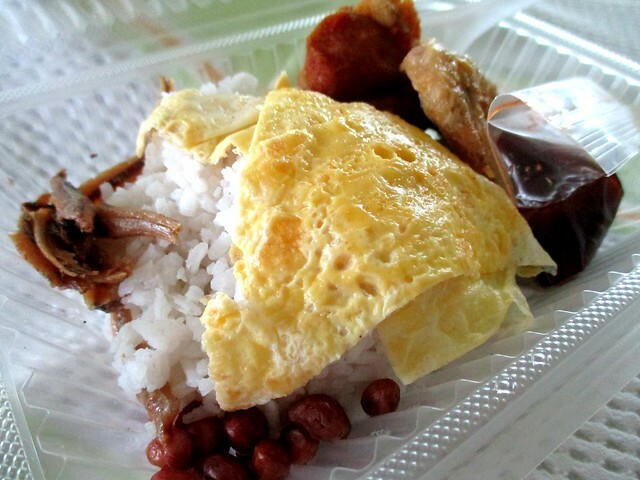 I guess by now, it is quite obvious whether or not I would go back for this particular nasi lemak ever again. The NASI LEMAK BANDONG WALK stall (2.313869, 111.825808) is located at Bandong Walk, Jalan Bandong somewhere in front of the block of shops where the 1Malaysia clinic is and MAK MET’s BREAKFAST STATION, the Malay kueh stall/shop, is at the other block of shops nearby, the back facing the main road, where PENYET BANDONG is in the evening. 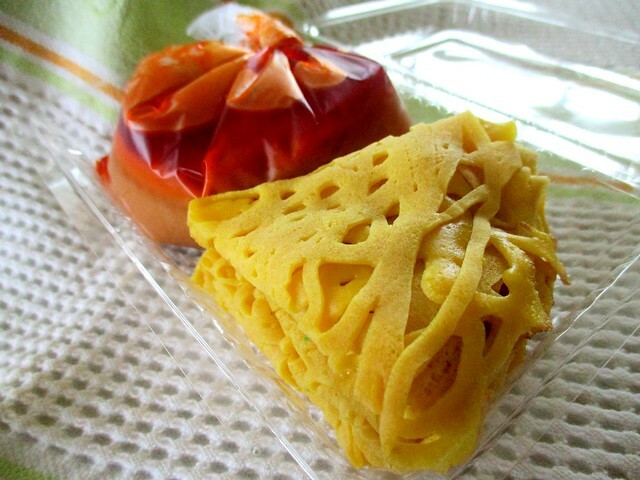 I like to eat roti jala because the it is soft and doughy. You like garing food I guess, that’s why you heat them in a pan again to get crispy edges. I first had it the way I like it at a nasi kandar shop in Penang and I loved it. Then I came across them doing it that way at a roti canai stall at a coffee shop here but for reasons unknown, they stopped making roti jala. Not all that crazy about it lembek-lembek like this. 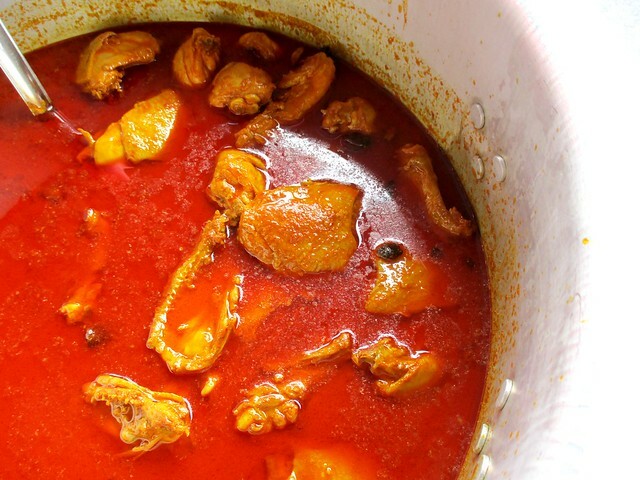 The curry looks fiery red. Must be very hot and spicy. Would love the kuih jala and cucur bubuk. No, not spicy at all or we would have loved it a whole lot more. Tasted nice though. 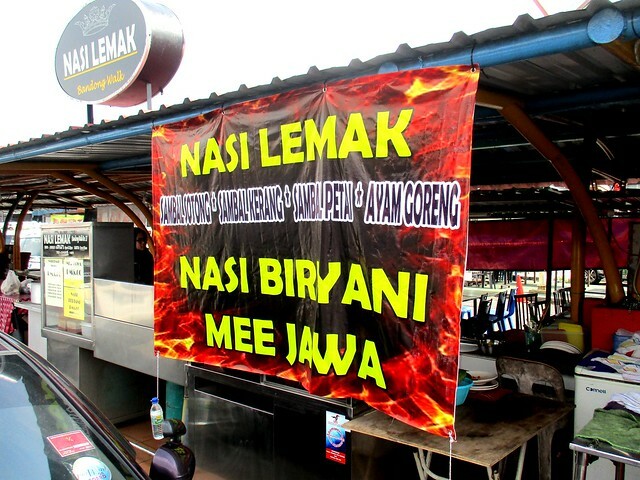 You can pass on the nasi lemak when you go there. 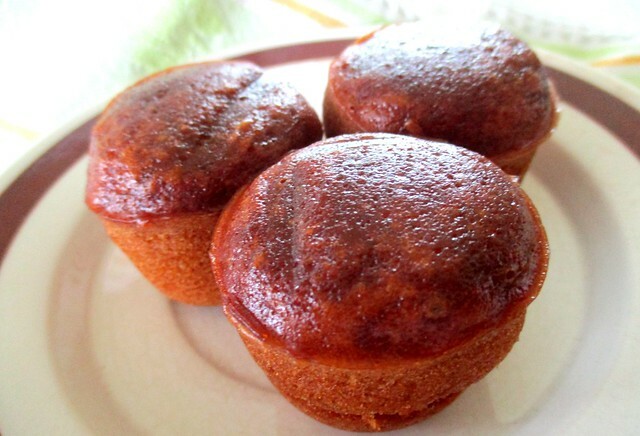 Kuih jala, I missed that. Of course, will never buy that one again especially when there are much nicer ones around. I’m glad there is one very good one here, just a few steps from the stall where I bought this not so good one and I know of at least two other places where the nai ie quite lemak. Many go for the sambal or whatever add-ons, I go for the rice, MUST be lemak or that will be the first and the last. I am rather fond of long grain rice. 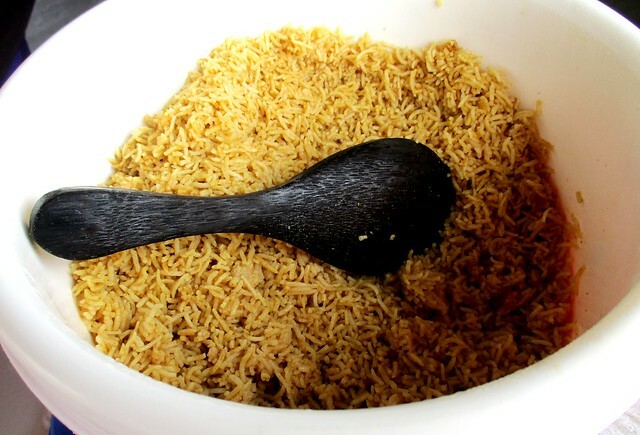 Have you tried Bario rice? Very nice…but they say it is not so healthy, starchy. Petai? I love petai too! Must check it out when I drop by again. I go for the sambal sotong, never mind that they are very small. I have never tried the cockles as the guy said he uses canned ones. No, thank you. Nasi briyani at RM5 is a good deal. SO it’s without papadum but I won’t mind for that price. The problem is keeping it crispy if not eaten there. Will go limp in no time at all.